Through memorable songs, an enchanting story, splendid music, surprises, and inspired sounds, these four friends (and award-winning musicians) herald the holidays together bringing Dylan Thomas’ enchanting boyhood memories to life like an old-time radio hour. Vocalist Suzi Stern composed and sings original songs, and narrates the story, along with first call pianist/composer Rich Harney (on two pianos), Evan Arredondo on double bass, and the eclectic and expressive Alex Coke employing flutes, saxophones and a dazzling array of toys inspired by the poet's Christmas memories. 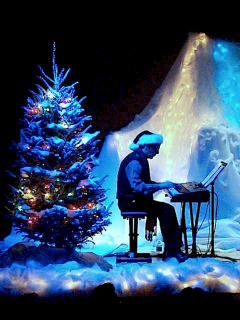 For listeners, art lovers, families, and children of all ages, A Child's Christmas in Wales gives the gifts of wonder, mirth, and music to all in an art quality cool production you won’t want to miss.